If you’re walking down the cobblestone streets of Siena, either you’ll be tempted to look up at the towering brick spires or you’ll be watching your footing. But trust me here, ignore the towers and risk tripping: the treasures of Siena lie in its pastry shops. 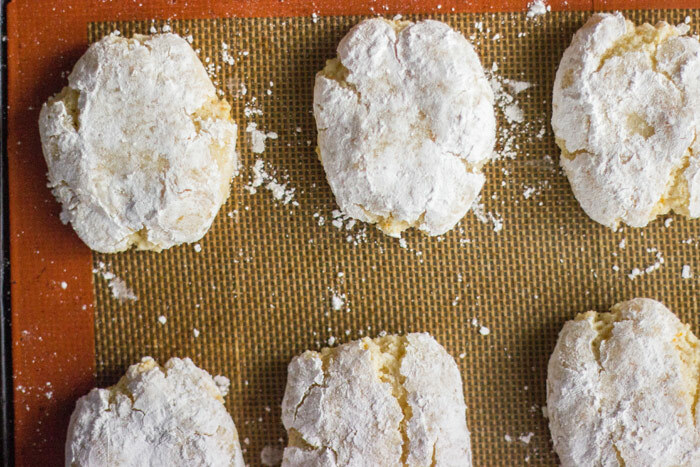 Panforte, marzipan, and biscotti are piled into confectionary towers, but the star of the windows is ricciarelli. Ricciarelli are the classic Sienese cookie. 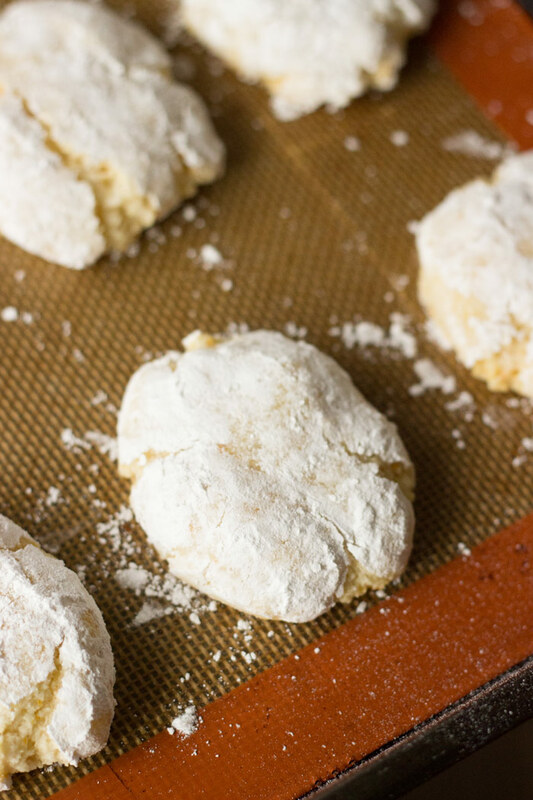 Made from almond flour, ricciarelli cookies were natrually gluten free before “Gluten Free” was on the map. They are soft and chewy with a light crumb and a crackly, crust covered in powdered sugar – think of a rustic (and much easier) macaron. The cookies are traditionally shaped like a flattened footballs but can be whatever you want. The flavors of this cookie come from the almond flour and a surprising hit of orange zest, adding brightness to an otherwise rich taste. The texture, then, comes from a whipped egg white. This addition keeps the cookies airy and light, as well as aiding in the slightly crispy bite of the outside. I rolled the dough in powdered sugar for a sweet coating and a classical look. To make the appearance of the cookie even more striking, complete with tiny cracks running through the powdered sugar, I allowed the formed cookies to rest and air-dry on the baking sheet for 45 minutes before baking. Once the room-temperature dough was put into the oven, the cookies were able to spread somewhat before the exterior was baked. Minimal spreading once the exterior had dried meant smaller, more numerous cracks. Forget the expensive ticket and the confusing currency exchanges—these cookies are one of the best bits of Siena. 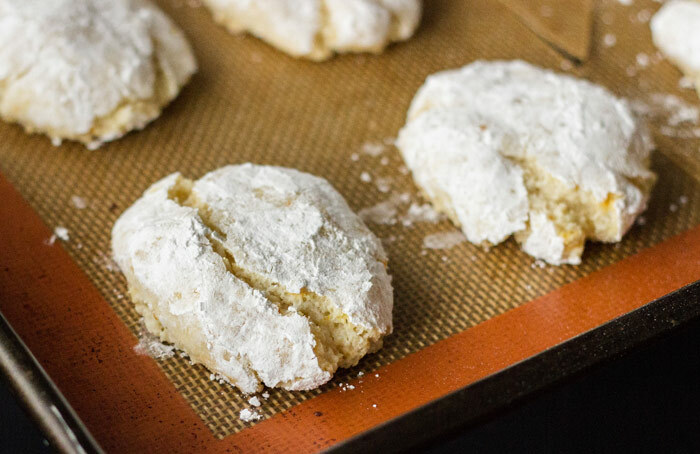 Grab a handful of ricciarelli and turn on some Puccini: You’ll swear you’re in Tuscany after the first bite. In a mixing bowl, combine the almond flour, granulated sugar, ½ cup powdered sugar, baking powder, salt, and orange zest. Whisk to combine and remove any lumps. In a stand mixer or bowl with a hand mixer, beat the egg white until stiff peaks form. Add the almond extract and vanilla extract and stir to combine. Add the beaten egg whites to the dry ingredients and fold to combine until a sticky dough forms. Divide the dough into 12 equal balls (a heaping teaspoon) and form each ball into the shape of a flattened football. You can also just flatten them to a round shape. Add the remaining ½ cup powdered sugar to a bowl. 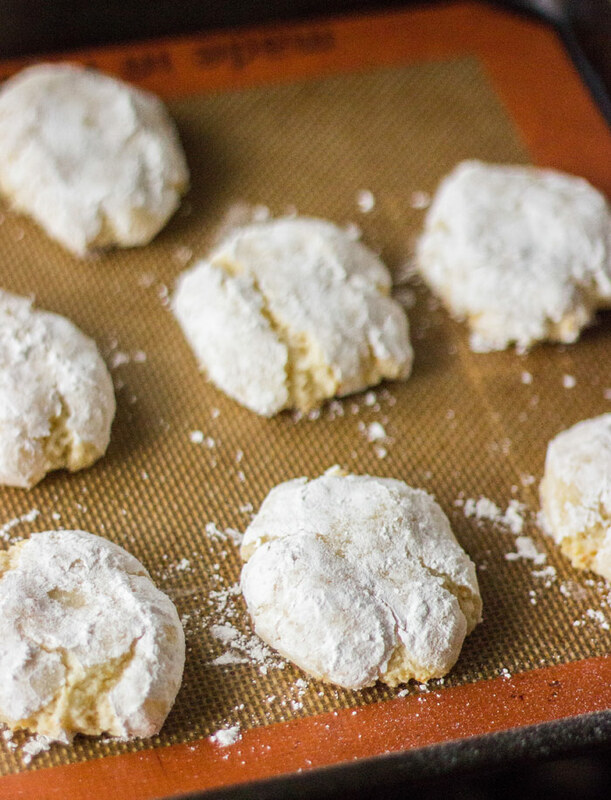 Dip each cookie into the powdered sugar and roll around to coat thoroughly. Transfer to a parchment or silpat lined baking sheet, leaving plenty of room in between each cookie as they will spread. Allow to sit at room temperature, uncovered, for 45 minutes to 1 hour. This will allow the tops to dry out slightly, creating a crackled crust. Bake for 25-27 minutes until barely golden brown on the top. Allow to cool completely then store in an airtight container for up to 1 week. I wouldn’t mind walking down the streets of Siena with a few of these cookies in tow. I can’t wait to try this recipe. Had these while living in Italy for three years, but they had a “lemon” flavor to them! So do I use lemon zest instead of the orange zest to achieve the taste I remember?